On Saturday June 14th, 2012, the UW Dept of Earth and Space Sciences held its annual Graduation Ceremony, hosted by Chair Robert Winglee. 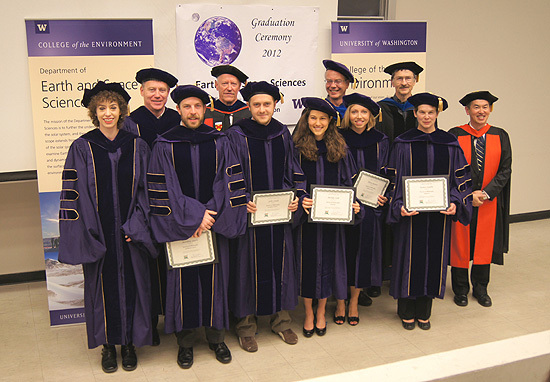 Receiving diplomas were 37 undergraduate students, out of a graduating class of 55. Receiving hoods were 10 out of a class of 17 Masters students, and 8 out of a class of 14 PhD students. This is one of our biggest graduating classes, and we again had to hold the ceremony in the Bagley Hall 131 auditorium with seating for 300, as our normal Johnson Hall 102 auditorium was not adequate. A reception was held outside by the Drumheller Fountain following the ceremony. 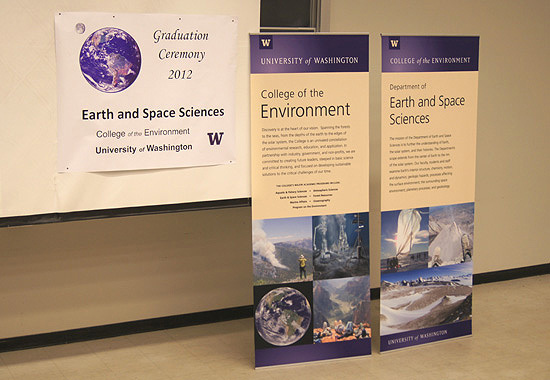 The 2012 Graduation Ceremony was hosted by Chair Robert Winglee, with special guest speakers Dean Lisa Graumlich and Dr A. Wesley Ward (UW Geology - '78), plus student speakers Teresa Kayzar and Harrison Togia. As a special final (free!) service for our graduating students, the ESS department recorded a video of the ceremony and shot still photographs of each student receiving their diploma. The photographs can be viewed online via a web slidshow, and/or each photograph can be downloaded in its full 12 Mpixel resolution for high quality printing. Use the "Orig-Pic" link at the top of each slideshow page to download and save the original fullsize photo (about 5 MB jpeg each). The video can be viewed as a live stream (1.5+ hours), or you can choose to download and save the almost 800 MB mp4 video. 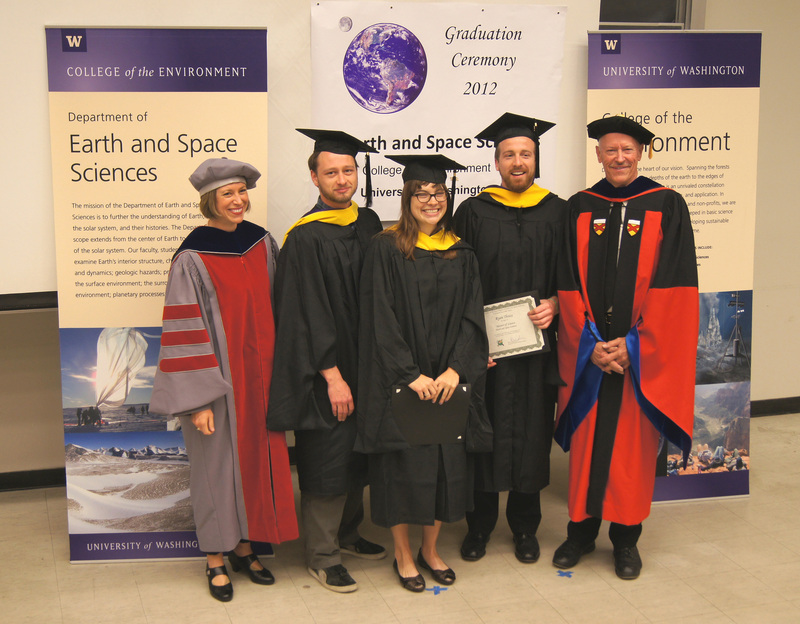 The video recording of the ESS 2012 Graduation Ceremony can be viewed as a live stream (1.5+ hours), or you can choose to download and save the almost 1.3GB mp4 video. You can view the graduation video as an online stream here, or you can download the mp4 file here. ( .mp4, 700 MB, 1 hour 26 min 51 sec ). We recommend using an up-to-date Google "Chrome" web browser for viewing the stream and we recommend using VLC Player to view the downloadable .mp4 file.